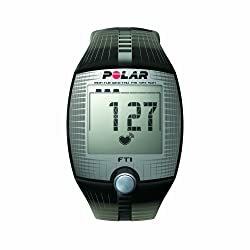 The Polar FT series are the fitness and cross training heart rate monitors. This series starts with basic model FT1. The advanced and best selling models are FT4 and FT7. All the three models contains features that enhance your ability to workout effectively and aid in improving your performance. Your ability to perform well depends on the accurate heart rate readings displayed on the monitor. All the three models of FT series are highly accurate because they use same heart rate sensor H1. However, H1 contains very limited features and if you are looking for sensor that can transfer your data to smartphones using Bluetooth, then you can check out H7 sensor. H7 sensor can be purchased separately and is compatible with all the 3 models. The good thing I like about this series is the variation. There is a good mix of features and the price range. Color choices are available for both Men and Women. Models are available in different colors. Good: Record storage capacity is 99. Transfer data to external compatible bluetooth device using Polar FlowLink, which can be bought as a separate accessory. Bad: FT7 is high end among FT1, FT4 and FT7. 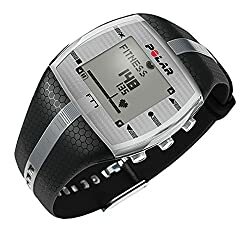 However, it is still a mid level model in comparison to advanced heart rate monitors such as Polar FT80, FT60 or FT40. Bottomline: It is good for someone who is serious about their fitness regime and want to track calories burned and likes to analyze his or her reading graphically. You are getting good features and excellent quality for very reasonable price. Good: Water resistant and support multiple Languages. Battery is user replaceable. Supports data transfer to compatible Gym equipments using Gymlink. Bad: Cannot transfer data using bluetooth. Storage capacity is more than FT1, still it is less. Bottomline: FT4 is a higher model compared to FT1. The price is reasonable. Good choice for someone who is starting their workout regime. Good: It is the basic model and relatively cheaper, thus a good choice for entry. It is water resistant till 30m. Supports data transfer to compatible Gym equipments using Gymlink. Bad: The memory storage is only 1. Support only English. Does not support user replaceable battery need to send to the manufacturer for battery replacement. Bottomline: Contains very limited features. Good for someone who is just looking for simple heart rate monitor and a watch. My vote goes for FT7. It has what FT1 and FT4 have and few extra features that can take your fitness regime to a much higher level. Even though, FT7 may cost a little more, but it is worth every penny spent. In FT1, you cannot replace the battery by yourself. Thus, you are stuck till company replaces it. Hence, I am not very much in favor of FT1. It’s a tough call to choose Polar FT4 vs FT7. To put it simple, FT4 is a good choice but if you can put some more bucks, you can buy the best FT7. Using my Polar FT7 watch along with the HR chest strap for quite some time now. I think it’s a great product and worth the investment…so far it’s been good for me. 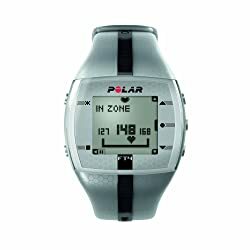 The only downside I think is that Polar didn’t give me any explanation manual with it and I found it kind of hard to know like what does fat burn zone mean, what does fitness zone mean, what should I be at or where is my target rate. Another thing that I miss is the GPS tracking.